The Little House of Concrete Bookshelves: Donna Leon "By Its Cover"
They say you can't, but with Donna Leon's Commissario Brunetti series that landed on its feet almost fully formed running to twenty-three titles anyone who's been along for most of the ride can take a glance at the book and have a pretty fair idea of what they'll be getting. The elements will, of course, vary from title to title. The amount of time Brunetti gets to spend at home and when he manages to get there will affect how much of his family the reader sees in each successive title. The actual case he's dealing with may or may not present opportunities for the wonderful and highly efficient Signorina Elettra to do her computer-based thing. Brunetti's boss, the entirely loathsome Vice-Questore Giuseppe Patta, will appear in his office just before lunch and depart not that long afterwards, and how far his nose sticks into Brunetti's case will depend on the case's effect on the issues that matter to him. Apart from Signorina Elettra most of the cast have been in place since the first title in a series that landed on its feet almost fully formed from the start of Death at La Fenice. You know, more or less, what you're going to get. It's just a question of detail and delivering an outcome. This time around it's an afternoon phone call from the director of Biblioteca Merula, a prestigious library with an extensive holding of rare books. A number of titles have had pages cut out, maps and illustrations rather than pages of text, and others have gone missing. As far as library director Dottoressa Patrizia Fabbiani is concerned there's an obvious suspect. American academic Joseph Nickerson, from the University of Kansas, has been using the library for research into medieval Mediterranean maritime trade but has suddenly vanished after daily visits over a solid three week period. Books he has requested are gone, others are damaged. There's your man. Q.E.D. He's definitely a suspect, particularly after his passport turns out to be a fake and a check with the University of Kansas reveals they have no one by that name on the payroll. But he's not the only regular visitor who passes under the gaze of library guard Piero Sartor. Another regular reader is the former priest the library staff has nicknamed Tertullian since his regular reading matter is mainly drawn from the works of this prolific early Christian polemicist against heresy. According to the Wikipedia Tertullian has been called the father of Latin Christianity and the founder of Western theology. According to Brunetti, on the other hand, he's dry as dust and the fact that anyone, ex-priest or not, would spend three years reading his voluminous output piques his interest. The latter day Tertullian also seems to have vanished and when he is found brutally murdered, Brunetti finds himself investigating something more serious than theft. The Patta angle this time around kicks in when he learns that several of the vandalised or missing volumes were donated to the library by Contessa Elisabetta Morosini-Albani, the wealthy widow whose late husband was the head of a long-established Venetian family. As a total philistine, the theft and vandalism barely register on Patta's radar. The possibility that the Contessa's nose might be put out of joint is entirely another matter and Brunetti is cleared to investigate a matter that might otherwise have been pushed to one side and pinned on the obvious suspect. Interestingly, when Brunetti interviews the Contessa his wife's aristocratic connections come into play as Brunetti quietly goes about piecing the ins and outs of the trade in purloined vintage editions together. By Its Cover seems to have been prompted by a wave of theft and vandalism in libraries, museums and churches, and particularly by the systematic looting of thousands of rare books from Girolamini Library in Naples unearthed in 2012. 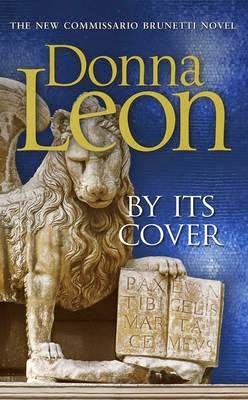 That was the work of the library's director, and here, as Brunetti patiently peels away the layers of things that aren't quite what they seem Leon gets the chance to vent through her characters. Theft and vandalism in the world of rare books aren't the only things to attract her wrath. There's a particularly well crafted incident involving a massive cruise liner Brunetti and his offsider encounter in the course of their perambulations (or the maritime equivalent thereof) and the presence of crowds of tourists as spring starts to kick in are a perennial target as well. When you're looking at a series that has been running this long you're always likely to suspect a tendency to phone it in, and you may well think that's operating here. There's not much that could be described as a new development, and not much room for Signorina Elettra to do her thing, but that's largely a function of the subject under investigation. You can use the internet to check things like prices of rare books, but that's about as far as it goes. But if the author is delivering the latest episode telephonically I'd suggest there'll be a tendency on the part of the reader to put things aside. By Its Cover's blend of intrigue, theft, blackmail and murder kept me turning the pages until I got to the end and left me looking for more after a characteristically abrupt end. The Golden Egg ended with Brunetti setting out for a brooding walk along a wind and rain swept Lido, and By Its Cover comes to a full stop because, really, once Brunetti has pulled out his phone and dialled the number of the Questura and requested the warrant there really isn't anything more that needs to be said.